Cycling Night at the New World Symphony! 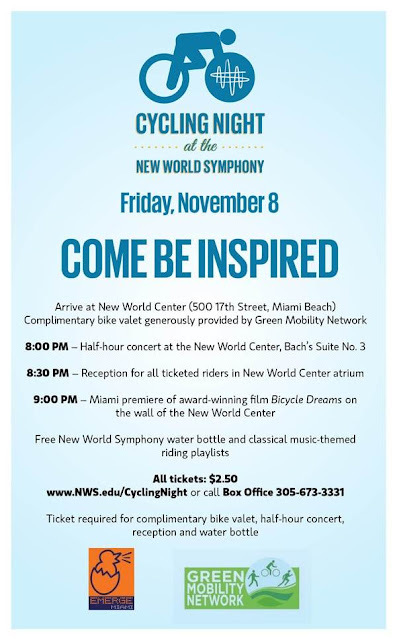 "The New World Symphony, America’s Orchestral Academy, will present the first “Cycling Night at the New World Symphony” on Friday, November 8, at the New World Center (500 17th Street). The event begins at 6:30 PM, as Emerge Miami and New World Symphony Fellows will lead a group ride from the Omni / Arsht Metro Station in Downtown Miami (1455 Biscayne Boulevard) to the New World Center on Miami Beach. At the New World Center, Green Mobility Network will provide complimentary bike valet service at the administrative entrance, behind the Center. Following NWS’ half-hour concert featuring J.S. Bach’s Suite No. 3, ticketholders will enjoy a reception in the atrium of the New World Center, and will receive classical music-themed cycling playlists and a New World Symphony water bottle. At 9:00 PM, the critically acclaimed film Bicycle Dreams by Stephen Auerbach will be given its Miami premiere on the New World Center’s wall. Bicycle Dreams chronicles The Race Across America, an annual epic 3000-mile bicycle race from the Pacific to the Atlantic, considered the most challenging sporting event in the world. Top riders finish in under 10 days, riding over 300 miles per day and sleeping only a few hours per night. Amid the sleepless grind, riders must endure the searing heat of the Mojave Desert, the agonizing climbs and descents of the Rockies, the driving winds of the Great Plains, and the twisting switchbacks of the Appalachians before the final sprint to the finish line in Atlantic City. These voyagers discover what is truly at stake as they pedal on, praying for the deliverance only the finish line can bring. By journey's end, some are saved, others are lost, but all learn that the fuel that takes a soul toward its own true destiny is desire. The film has won 15 awards at film festivals across the U.S. No ticket is necessary to attend the screening in Miami Beach SoundScape. 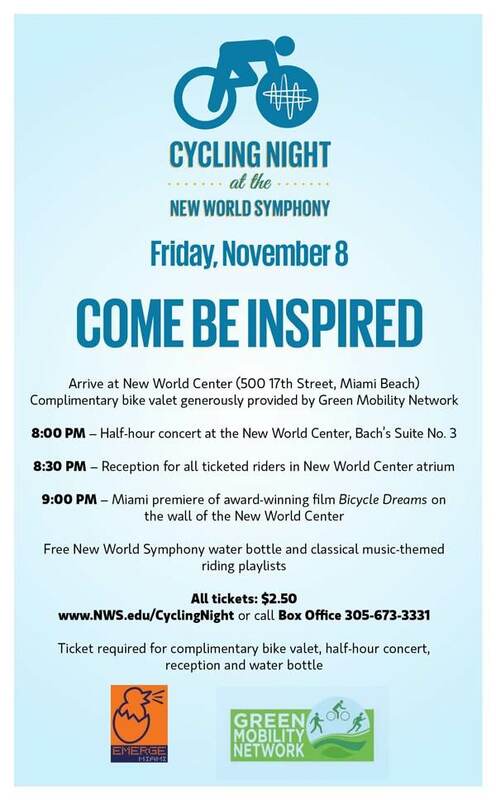 Tickets for Cycling Night at the New World Symphony, which include bike valet at the New World Center, the 30 minute concert by the New World Symphony, reception and water bottle are limited and are available online at www.nws.edu/cyclingnight, or by calling the New World Symphony box office at 305-673-3331." Bring food or snacks and enjoy the show picnic style!